YouTube will not terminate Austin Jones’ channel in the wake of him pleading guilty to coercing six underage fans to send him graphic videos of themselves. Here’s why: In criminal cases, the platform will only remove a YouTuber’s channel if they’re convicted and their channel’s content is closely related to that crime. For example, when Heather and Michael Martin, the parents behind the now-infamous DaddyOFive channel, were convicted of abusing their children, YouTube terminated their channel (as well as several related channels) specifically because the channel featured footage showing how the Martins treated their children. But Chris Brown, who in 2009 pled guilty to assaulting then-girlfriend Rihanna, has a YouTube channel — and his won’t be terminated, because its content isn’t related to his conviction. In this case, YouTube has judged that Jones’ crimes are not closely related to his content, and that his content does not violate YouTube’s terms of service, so his channel (which has 534,000 subscribers) will remain standing, the platform tells Tubefilter. However, YouTube adds that it did demonetize Jones’ content after his arrest back in 2017, so he’s no longer making money off the 40 videos — mostly a capella song covers — still uploaded on his channel. 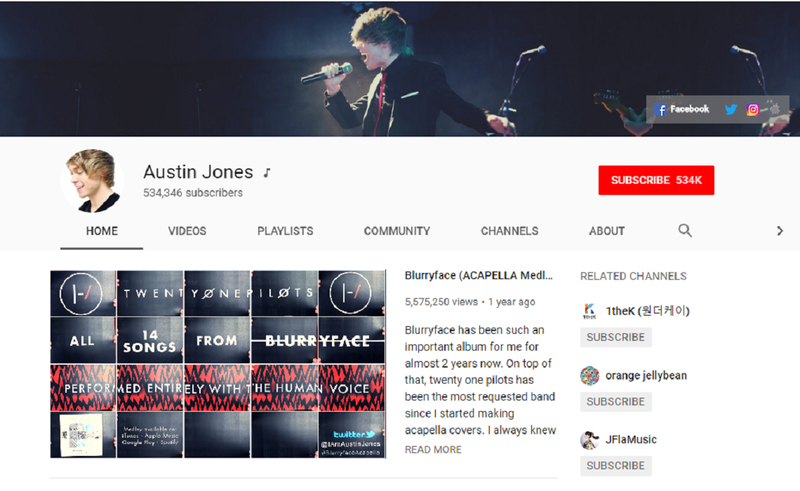 YouTube’s judgment in Jones’ case is in line with previous decisions, but it is worth noting Jones used the fame he achieved on YouTube to lure underage fans. Court filings show Jones had contact with more than 30 underage girls, and often asked them to send him graphic videos to prove how much they liked his work.